Highlights from the past month-ish, as seen in our official changelog. At the risk of repeating ourselves, the highly anticipated full support for recurring event editing, deleting, and booking is ready for prime time. Get the full scoop in our announcement post. We’ve redesigned the app with your schedule front and center, making it easier to view and manage upcoming events. Use it to manage events both in and out of the office, including a much more powerful space search. See the announcement post for more. Organizations can now control how far in advance people can check into meetings, instead of sticking with the default of 2 hours. Earlier confirmations help teams communication in advance which meetings are still likely to happen, and let you skip check in on the room display. Admins can change how merciful flexible they are via Settings > Organization > Event Customizations. 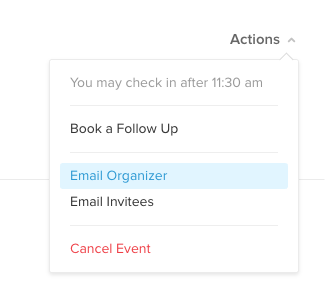 We’ve expanded event options to non-admins, and members can now email event organizers via the Actions menu, even if they aren’t part of the meeting. Use this to coordinate last minute changes with colleagues, or get in touch with folks you haven’t met yet. Space scheduling rules will will now show when they have presence enabled, so you can stop hunting for beacons. Event pages show organizers separately from the invitees, so you always know who to contact. The space browser (available via Browse or CMD/CTRL + K hotkey) includes a little more information, including calendar, capacity, and space type. 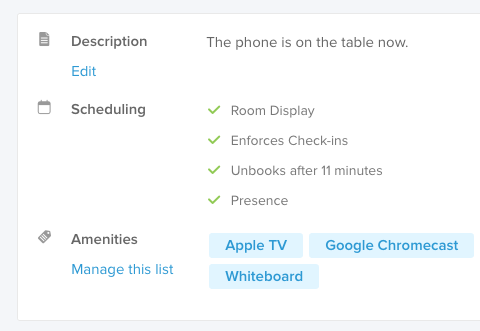 Based on feedback, we’ve updated “Confirm” in the apps to match the room display language of “Check In”. Once checked in, your meeting is confirmed. We’ll preselect your current location when creating new spaces in your office. Added instructions to the billing page for activating additional spaces. Less guessing involved, we’d guess. Default location is now used in more places, including search. Set yours today, and save a few clicks. Some room displays would report incorrect “Last seen” times. We’ve released the first of two patches automatically, and you should start to see those times go back to normal shortly. Changing the start time of your event in the event composer will no longer effect event duration. Editing an event you aren’t invited too will no longer drag you back into the invitee list. Fixed a few issues where billing forms for non-US addresses would insist (REALLY INSIST) that a state was necessary. Fixed layout issues where opening the sidebar would sometimes cause drop downs to clip under other parts of the page. Specific? Yes. Infuriating if you were affected? Also yes. The web dashboard will no longer show error messages when you intentionally close a modal without saving it. The mobile app will now capture SAML redirects instead of leaving you hanging on a blank screen on slower connections. Despite certain pages claiming otherwise, the max image upload size is 3MB. Those pages have since apologized and updated their labels accordingly. Fixed an issue where some freshly connected Google accounts would not have the permissions required to refresh their authorization. Expanded device status analytics, including email notifications when things don’t go according to plan. Space-by-space analytics, with more detail to help you figure out what a “normal day” looks like. We could do a better job of helping folks set up (parts) of their calendar automatically. It should be easier to add multiple calendars at once. Grouping spaces by floors, and easier browsing for non-admins. For a longer view, check out our public roadmap. At the risk of repeating ourselves, the highly anticipated full support for recurring event editing, deleting, and booking is ready for prime time.